The family of the unarmed man who was allegedly fatally shot by a BART police officer in January is protesting Tuesday, calling for the officer to be fired and charged with murder. Shaleem Tindle, 28, of Oakland was allegedly shot and killed by BART police Officer Joseph Mateu on Jan. 3. A distraught mother says her son’s killing at the hands of a BART police officer last month was not justified. "BART police murdered my son, shot him in the back with his arms up," she said. Tindle's family immediately sought answers and hired high-profile civil rights attorney John Burris to help them. "There is absolutely no justification for the use of deadly force if a person is unarmed and complying with an officer’s directives," said Burris. 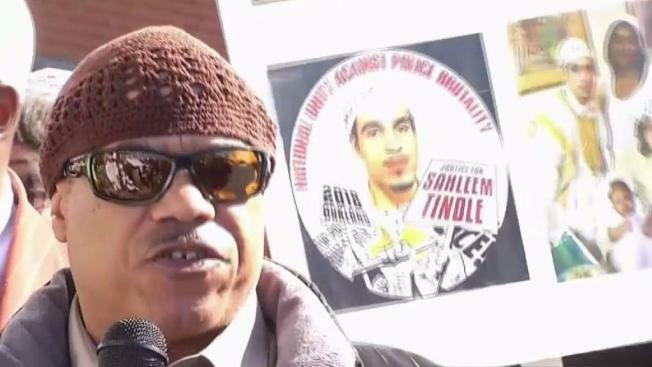 "Any suggestion that Shaleem was armed and uncooperative is simply an attempt to demonize Shaleem and provide a false justification for Shaleem’s unlawful murder at the hands of Officer Mateu." According to Burris, the family will file a state law claim against both BART police and Mateu. They will seek damages for both the death of Shaleem as well as his family’s loss of their familial relationship. The shooting occurred about 4:40 p.m. near the West Oakland BART station following a fight between Tindle and another man. Witnesses say Tindle was on his way to BART with his family when he got into a fight with someone on the street, and the situation quickly escalated. Police said Tindle pulled out a gun and shot the man in the leg. At that point, police say, a BART officer rushed over and fired at Tindle after Tindle refused orders to put down the gun. "The mere fact that two men are grappling in and of itself is not a basis to shoot someone," Burris said. "I am always concerned when an officer has his gun out and is running to a situation. That often means they have very few options available to them." Pastor Truckie, owner of Upper Kutz Barbershop on Seventh Street, said the shooting happened in front of his store. Like so many others, he is frustrated with the growing violence in his community and what he calls the demonization of black men that comes with it. Truckie organized a prayer circle to unite his community after seeing his friend killed. "I saw two black men in a situation, and I didn’t like either side," Truckie said. "I didn’t like the fact that one was hurt, and I didn’t like the fact that one lost his life. So, I saw two of my brothers who needed some help. "The brother who passed, I see him all the time," Truckie added. "His son gets his hair cut at my barbershop." Tindle leaves behind two sons, ages 8 and 2. Oakland police said they found a gun at the scene, and they're seeing if there is a connection.